Local tour guide, travel guide, suggestions/assistance, organisation by "Bouctou"
"Bouctou" speaks french perfectly, he knows some english as well and communication by eMail is possible in both languages. * Travel companion: The entire trip is paid individually by you. You decide where to go, where to sleep, which bus or taxi to take. You choose the Hotel or Campement where to sleep and where and what to eat. "Bouctou" organizes your trip, gets the tickets, knows where to go and he is your translator. Payment to be discussed (price per day), plus expenses. * All-iclusive offer: You discuss a package price for e.g. 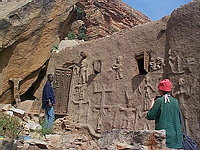 a 5 day journey to Dogon country. This price is per person (reductions for 2 persons or more) and includes bus, taxi, hotels, camping, local meals und "Bouctou" as local guide. * Assistance for your stay in Bamako: Pick-up at Bamako airport Sénou (many flights arrive or depart in the middle of the night). Tipps for you Bamako visit, finding a good located hotel , tips for shopping, etc. Call Roland Baumgartner (geographer, Switzerland) and get further information. The Baumgartners and Bouctou know each other for 15 years.